Heute morgen hab ich meine beiden neuen Stempel von WoJ bekommen. Neben dieser zuckersüßen Schnecke hab ich mir noch Melinda als Firmling gegönnt. In den Stempel hab ich mich gleich verliebt, als man das Motiv zum 1. Mal sehen konnte. Ich finde sie supersüß und auch vielseitig einsetzbar. Hier mein 1. Kärtchen damit...nach dem aktuellen Sketch von Truly Scrumptious gearbeitet. Neben dem Sketch selbst, sollte auf der Karte auch irgendwas glitzern oder funkeln. Daher hab ich die Flügelchen mit Stickles bearbeitet und auch noch ein kleines Charme eingearbeitet. Today I've got my 2 new WoJ Stamps. Together with this supercute little snail I also bought Melinda as confirmant. I loved this stamp from the time on I saw it for 1st time. This stamp is so lovly and also so good to use for many occasions. 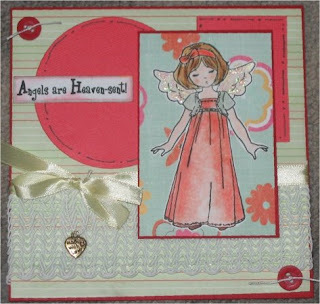 Here's my 1st card with it...worked with the actual sketch of Truly Scrumptious. With the sketch itslef there should be something shiny on the cards too. So I colored the little wings with stickles and I also used a little charme. This is really pretty Heide. I love the shimmer on her wings. Thanks for joining in the TS challenge. Gorgeous card! This is such a lovely image and the glitter wings look fab! Thanks for joining in with the Truly Scrumptious challenge!